The Spectacled Bear, or Andean Bear, is a relatively small black or dark brown bear and is the only bear found in South America. The species is commonly known as the Spectacled Bear since they often have distinctive white or brown markings encircling their eyes, resembling spectacles. However, the markings are individual to each bear; some have very faint markings, perhaps only on one side of the face, and some have plain black faces with no spectacle markings at all. As the only bear that comes from Peru, the Spectacled Bear is also clearly the original of Paddington, the fictional bear and hero of Michael Bond’s many famous children’s books. Spectacled Bears are active during the day and are very opportunistic; their diet and behaviour depends on their local habitat. They are mainly vegetarian; they usually eat fruit, leaves and honey, but they also forage for insects and occasionally feed on small mammal such as birds and mice. As enough food is available all year round, Spectacled Bears do not hibernate. Spectacled Bears are very good climbers and sometimes build platforms in trees by pulling down branches and lianas to form a flat area on which they may feed and rest. They are generally solitary animals and leave messages for other bears by rubbing their backs against the tree trunks, leaving scratch marks with their claws, and perhaps urinating or leaving a hormonal secretion around the scratched area. Like all bears, Spectacled Bears have a highly developed sense of smell. The bears usually give birth to one or two cubs between December and February and cubs probably stay with the female for around a year. 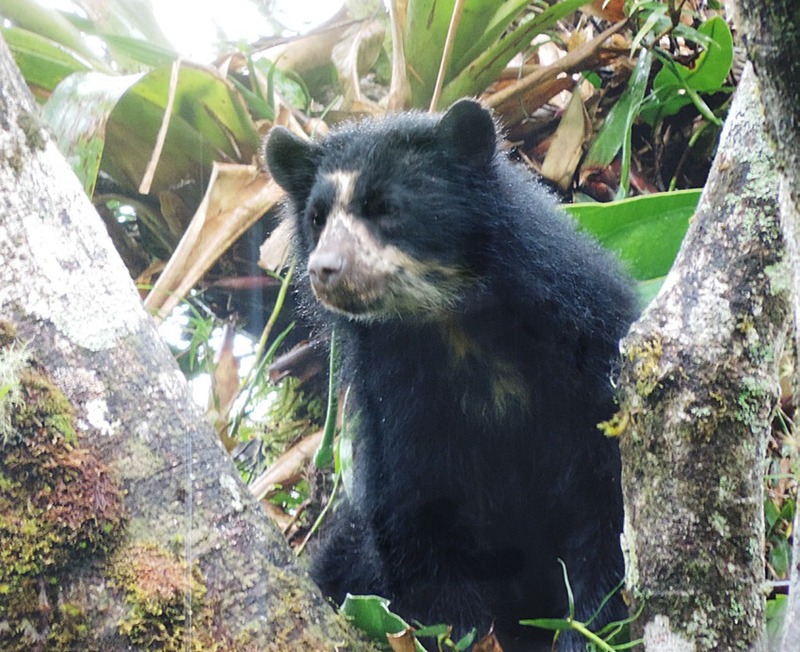 Spectacled bears only live in the Andes mountain range in South America, in a narrow strip running from western Venezuela through the Andes in Colombia, Ecuador, Peru, and Bolivia, and ending in northwest Argentina. They generally live in forested areas but can also be found in more open scrub land. 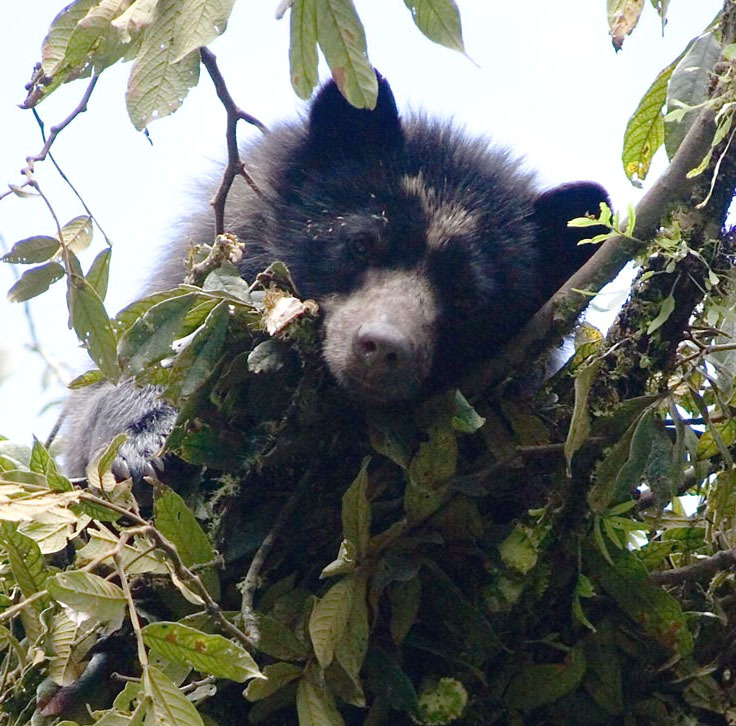 Spectacled Bear numbers have fallen sharply as a result of habitat fragmentation and hunting. In areas where cornfields have replaced the natural forest, bears have got a taste for maize, and are now a problem for farmers: who sometimes shoot the bears to stop them feeding on their crops. The species is also vulnerable from poaching to meet the high demand for bear gall bladder in Asia. The gall bladders are highly sought after for medicinal purposes and despite the ban on trade by the Convention on International Trade in Endangered Species (CITES) the bears are still being killed illegally.